The state’s strong revenue performance-a $7.5 billion increase since January-presents an extraordinary opportunity for the Legislature. Key decisions are: (1) how much of the increase should be provided to K-14 education, (2) should increased school funding be allocated to new initiatives or to strengthen existing programs and pay off debts, and (3) which state debt should be prepaid? We urge the Legislature to focus on regaining the state’s fiscal balance, particularly in light of the risks and uncertainties facing the state. In the May Revision, the administration proposes to allocate nearly 40 percent of a $7.5 billion increase in revenues to K-14 schools, with the balance for the prepayment of budget debt; the build up of the reserve; and a combination one-time and ongoing augmentations to health, resources, corrections, and local governments. The budget also includes a proposed settlement to a lawsuit involving school funding resulting in added annual out-year obligations averaging over $400 million for seven years. Our Bottom Line. The updated proposal has a number of positive features, including its reliance on cautious revenue assumptions and its emphasis on debt prepayments, one-time spending, and the build up of the reserve. Even with these positive features, however, the state will continue to face structural budget shortfalls in the subsequent years, at a time in which it will be facing a number of risks and budgetary pressures. For this reason, it will be important for the Legislature to consider the trade-offs involved in sharply rising ongoing commitments in education. Also, while we strongly support the administration’s emphasis on budgetary debt prepayment, more of an emphasis should be placed on debt prepayments and reserve build up that provide benefits to the General Fund in the next couple of years-when the projected shortfalls are the largest-rather than several years down the road. In January, the Governor proposed a budget that provided significant new funds for K-12 and higher education, targeted increases in the judiciary and criminal justice programs, and more-or-less baseline increases in other state programs. Based on much stronger-than-expected collections of personal income taxes in April, the May Revision projects an additional $7.5 billion in revenues in 2005-06 and 2006-07 combined. As shown in Figure 1, the May Revision allocates about $4.3 billion of these increased funds for additional program spending, $1.6 billion for the prepayment of budgetary debt, and $1.6 billion to increase the 2006-07 year-end reserve. In terms of program spending increases, about two-thirds of the total is devoted to K-14 Proposition 98 education, where the Governor is proposing increases for a variety of one-time and ongoing purposes. The budget also includes new funds for health care disaster preparedness, additional corrections-related costs, local government grants and reimbursements, and flood control (including $500 million appropriated by AB 142 [Nuñez], which was part of the infrastructure agreement reached in early May). To help address major budgetary shortfalls in the 2001-02 through 2004-05 period, the state engaged in a substantial amount of budgetary borrowing. In the January budget, the Governor proposed to prepay $1.6 billion of these debts in 2006-07, leaving roughly $20 billion of outstanding budgetary debt at the close of the budget year. This consisted of $15 billion owed to private markets, and about $5 billion to local governments, schools, and special funds (mostly transportation). As the accompanying figure shows, scheduled repayments on that debt were projected to rise from $3.7 billion in 2006-07 to a peak of $5.4 billion in 2008-09, before falling to just over $4 billion in 2009-10, and further to below $1 billion in 2010-11. These payments include both the amortization of certain debt (such as deficit-financing bonds, local mandates, and settle-up payments to schools) and lump sum payments for other debt (such as loans to transportation and other special funds). The May Revision proposes a number of changes that would have impacts on both the total amount of borrowing outstanding and the annual payments associated with the debt. Borrowing Outstanding. Despite proposed prepayments of an additional $1 billion in deficit-financing bonds and $600 million in other debt, the state would end 2006-07 with about $21.6 billion in budgetary debt outstanding. This is because the May Revision includes a proposed settlement to a court case involving Proposition 98 school funding. Under this agreement, the state would provide an additional $2.9 billion in school funding over a seven-year period. Annual Debt-Service Payments. The May Revision spreads out budgetary debt repayments in a number of areas. It assumes refinancing of roughly $1.4 billion in remaining Proposition 42 loans over ten years (consistent with the passage of SCA 7 [Torlakson] to be considered by voters in the November election) and it pays off the new school settlement obligation with annual payments averaging over $400 million for a seven-year period. On the other hand, its prepayment of deficit-financing bonds will enable the state to pay off the bonds by the middle of 2009-10, or about one-half year earlier than assumed in January. The figure shows that annual costs are somewhat less in the May Revision during 2007-08 through 2009-10, but more in 2010-11. Total payments are between $3.3 billion and $4.6 billion annually over the 2007-08 through 2009-10 period-amounts which are greater than the operating deficits projected for the period. 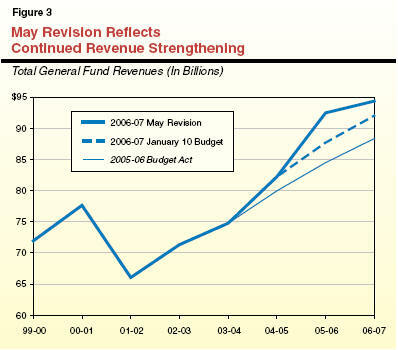 Figure 2 shows the administration’s estimate of the General Fund budget condition in 2005-06 and 2006-07 after taking into account the May Revision budget proposals. It shows that the current year is expected to begin with a prior-year fund balance of $9.5 billion. Revenues and expenditures roughly balance in 2005-06, enabling the year to close with an ending balance of $9.4 billion, and a reserve of $8.8 billion. In 2006-07, General Fund revenues total $94.3 billion, or $6.7 billion less than the $101 billion in expenditures proposed for the year. This leaves a year-end fund balance of $2.7 billion and a reserve of $2.2 billion. It should be noted that the large operating shortfall in 2006-07 is partly a reflection of the administration’s proposals to prepay over $3 billion in budgetary debt owed in future years. Recent Developments. At the time the 2006-07 Governor’s Budget was released in January, the U.S. and California economies had experienced a year of solid economic growth, although there were signs of softness in the fourth quarter of 2005. The administration’s budget forecast, as well as our February projections, assumed that the softness would be temporary, and that the U.S. and California economies would experience moderate growth in 2006 and 2007. As we noted in our February Perspectives and Issues outlook, these forecasts were subject to significant downside risks from both (1) a steeper-than-expected decline in California’s real estate markets and (2) a sharper-than-expected rise in energy prices. Economic developments since our previous forecasts have been somewhat mixed. On the positive side, U.S. and California growth in early 2006 has generally been better than expected, with business profits, employment, exports, and wage payments meeting or exceeding expectations. Recent revisions also show more California job growth in 2005 and early 2006 than previously thought. While real estate activity has continued to soften in California in early 2006, the declines so far have been orderly, reflective of a settling down of activity rather than the bursting of a real estate bubble. On the negative side, the rebound in gasoline prices this spring has been greater than expected. Though the higher prices have not yet had major effects on consumer spending on other goods and services, recent reports that show declining consumer confidence levels provide warning signs that further increases could result in slower economic growth ahead. Given the unsettled nature of world oil markets, further increases in energy prices remain a key threat to the outlook. May Revision Forecast. Taking into account these positive and negative developments, the administration’s updated forecast is generally similar to its January projection. It assumes that inflation-adjusted U.S. gross domestic product growth will slow from 3.5 percent in 2005 to 3.3 percent in 2006 and 3 percent in 2007. This compares to the January budget estimates of 3.6 percent, 3.2 percent, and 3 percent for the same three years. The May Revision assumes that California personal income will increase by 6.2 percent in 2006 and 5.8 percent in 2007, up slightly from the January projected growth rates of 5.8 percent and 5.5 percent. Recent Developments. Current-year revenue collections have dramatically exceeded the January budget projection. Total receipts through early May are up by nearly $4.5 billion relative to the January forecast, with over three-fourths of the gain related to much stronger-than- expected personal income tax final payments filed in April. The extraordinary growth in these payments (which were up by over 40 percent between April 2005 and April 2006) appears to be related to higher-than-expected levels of capital gains from large stock-related transactions and real estate sales, as well as strong business earnings. However, there is only limited information at this time on the mix of these factors, as well as the extent to which they are due to one-time developments. May Revision Forecast. The administration’s updated forecast assumes that total revenues will be $92.5 billion in 2005-06 (a 12 percent increase from 2004-05) and $94.3 billion in 2006-07 (a 2 percent increase from the current year). The current-year total is up $4.8 billion from the January budget estimate, primarily reflecting a $3.9 billion gain in personal income taxes and a $700 million increase in corporate taxes. The budget-year increase since January is $2.7 billion after adjusting for policy-related changes. The administration’s forecast assumes that roughly one-half of the current year increase in personal income taxes relative to January is related to one-time sources, such as nonrecurring capital gains. Upward Revisions Over the Past Year. As shown in Figure 3, the current-year and budget-year increases reflect a continuation of an upward trend to revenue projections. Over the past year, total projected revenues estimated for 2004-05 through 2006-07 have increased a combined total of almost $17 billion. The May Revision’s economic and revenue forecasts are generally reasonable in view of recent developments and uncertainties about how much of the extraordinary growth in final payments in April is due to one-time versus ongoing factors. We believe that there is upside revenue potential in 2006-07, mainly related to continued strong growth in business earnings thus far in 2006. However, given the uncertainties facing the economy over the next year related to oil prices and real estate, as well as the lack of information about the one-time versus ongoing nature of the April final payments, the cautious approach taken by the administration is prudent. Figure 4 provides information on the programmatic features of the May Revision. Given the large proportion of additional spending committed to education, we focus below on the administration’s Proposition 98 proposals. That discussion is followed by a review of the May Revision’s transportation proposal. Increases K-14 Proposition 98 funding beyond January proposal by $2.1 billion in 2005‑06 and $800 million in 2006‑07. K-12 per pupil funding would increase from slightly over $7,400 in the 2005‑06 Budget Act to nearly $8,300 in 2006‑07. Also includes proposed settlement to lawsuit related to $2.9 billion in additional one-time Proposition 98 funding. Annual payments would be made over seven years, beginning in 2007‑08. Provides $400 million for hospitals and public health clinics to increase patient care capacity to meet public health emergencies. Drops January proposal to further delay “pass-through” of the federal January 2007 Supplemental Security Income/State Supplementary Program cost-of-living adjustment until July 1, 2008, resulting in lost savings of $44 million. Provides targeted increases in areas of children’s health care, child support payments, and child welfare services. Includes increases of about $500 million for additional inmate population and corrections-related health care costs. Makes $87 million prepayment of state’s 2007‑08 obligation for prior-year mandate costs. Provides no funding for 2006‑07 mandate claims. Increases funding for the Citizens’ Option for Public Safety (COPS) and Juvenile Justice Challenge Prevention Act programs by $43 million, and provides $40 million to new county trust funds for local detention facilities. Reflects $500 million in funding for flood control provided in AB 142, (Nuñez). Makes $100 million in additional payments for local flood control subventions, and includes various other one-time emergency funds for flooding earlier this year. Proposes that “Public Transportation Account spillover” funds (related to sales taxes on gasoline) be diverted from transit programs to debt-service payments on transportation-related general obligation bonds. Figure 5 displays the May Revision changes in Proposition 98 funding compared to the January budget. The Governor proposes an additional $2.1 billion in the current year to meet the required increase in the Proposition 98 minimum guarantee-an additional $1.8 billion for K-12 and an additional $245 million for community colleges. The higher minimum guarantee results from the rapid increase in General Fund revenues in the current year. For the budget year, the Governor provides an additional $793 million for K-14 education. For the budget year, almost all of the increase goes to K-12 education. a Includes Proposition 98 funding spent by other agencies including the Department of Corrections and Rehabilitation and state special schools. Figure 6 compares the proposed 2006-07 Proposition 98 funding level to the 2005-06 Budget Act, which generally represents the funding level that schools have for their current-year operations. Total Proposition 98 funding would increase by 10.3 percent over the 2005-06 Budget Act level (10 percent for K-12 and 12.8 percent for community colleges). The figure also shows that K-12 Proposition 98 spending per pupil increases significantly. When the 2005-06 Budget Act was adopted, we estimated per pupil spending at $7,402. The Governor is now proposing $8,291 per pupil for 2006-07, an increase of $889 per pupil or 12 percent. Governor Proposes Agreement With Education Community Related to 2004-05 Suspension. Chapter 213, Statutes of 2004 (SB 1101, Committee on Budget and Fiscal Review), suspended Proposition 98 for 2004-05, and established a target funding level for K-14 education that was $2 billion lower than the amount called for by the guarantee. We refer to this spending level-$2 billion below the minimum guarantee-as the Chapter 213 target. Over the course of 2004-05, an improving economy resulted in the state receiving significantly more revenues than were projected when the 2004-05 Budget Act was enacted. This increase in revenues would have resulted in a substantial increase in the K-14 minimum guarantee had the state not suspended Proposition 98. As a result, the spending level needed to meet the Chapter 213 target increased above the funding level provided in 2004-05. This funding gap became an issue of contention between the state and the education community. Because the 2005-06 Proposition 98 minimum guarantee is calculated based on the funding level for 2004-05, the 2005-06 funding level is below the Chapter 213 target as well. For 2006-07, the Governor’s January budget proposed K-14 spending to return the funding level to the Chapter 213 target, but did not provide one-time settle-up funds for 2004-05 or 2005-06. The education community sued the state, claiming that the state “owed” schools the additional funding in 2004-05 required to meet the Chapter 213 target. The Governor’s May Revision proposes to settle this disagreement with the education community. Specifically, the Governor proposes to restore the K-14 funding level to the Chapter 213 target for the budget year, and settle up to the Chapter 213 target for 2004-05 and 2005-06. Figure 7 shows the impact of the Chapter 213 target on Proposition 98 spending for 2004-05 through 2006-07, as adjusted for the Governor’s new revenue, attendance, and other assumptions that determine Proposition 98 funding. Specifically, the Governor proposes to pay off $2.9 billion in one-time settle-up payments ($1.6 billion from 2004-05 and $1.3 billion from 2005-06) over seven years beginning in 2007-08. (These funds would be on top of the Proposition 98 minimum guarantee obligations for those specific years, and will be counted as appropriations for 2004-05 and 2005-06 for Proposition 98 purposes.) 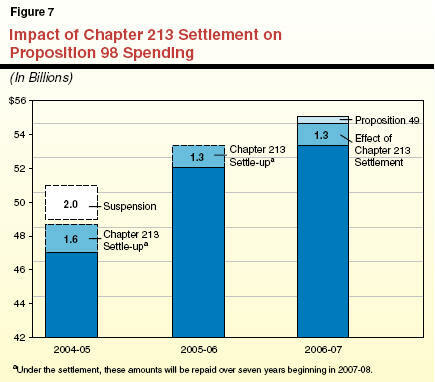 The budget-year impact of the Chapter 213 settlement is around $1.3 billion. Prepayment of Prior-Year Proposition 98 Obligations. In addition to these settle-up funds for 2004-05 and 2005-06, the state continues to owe $1.4 billion to meet the Proposition 98 minimum guarantee for fiscal years 1995-96 through 2003-04. Existing law requires these obligations to be settled in annual $150 million payments starting in 2006-07. The January budget includes the 2006-07 payment, and the May Revision proposes to make the 2007-08 $150 million payment a year early. These funds would be used to fund unpaid mandate costs from prior years. This would leave a total of $1.1 billion of these settle-up obligations outstanding at the close of the budget year. Lower Attendance Frees up Funding. Attendance has decreased substantially for both K-12 schools and community colleges. For K-12, the administration estimates that attendance is 37,000 less in 2005-06 and 66,000 less in 2006-07 than projected in January. A large portion of the savings from lower attendance is automatically redirected to the costs of declining enrollment provisions. The remainder is redirected to new programs discussed in detail below. For community colleges, the administration estimates that the community colleges will fall about 60 percent short (or 20,000 full-time equivalent students) of their 2005-06 growth target, and thus about $85 million of their 2005-06 enrollment growth funding will revert to the Proposition 98 Reversion Account. The May Revision would rebench community college base enrollment funding downward by $85 million to reflect this enrollment shortfall. The administration continues to propose 3 percent growth, but now off this lower base. The Governor’s proposal for K-14 education presents the Legislature a rare opportunity to address critical issues in K-12 education and community colleges. With the increases proposed in the May Revision, the administration would commit more than $10 billion in new ongoing and one-time funds for education. These funds are the result of the natural increase in the Proposition 98 minimum guarantee, spending to settle up past year minimum guarantees, and the settlement of the dispute about the 2004-05 suspension. Higher ongoing funding accounts for $5.1 billion, about one-half of the increase. The budget proposes $2.6 billion in one-time funds, including $2.1 billion resulting from a higher Proposition 98 minimum guarantee for 2005-06. In addition, the budget provides $556 million to settle up Proposition 98 obligations for past years (pre-2004-05), and spend funds that have accumulated in the Proposition 98 Reversion Account. The May Revision also proposes to commit the state to appropriating $2.9 billion in Chapter 213 related settlement funds that would be programmed now, but spent in 2007-08 through 2013-14. Strengthen Base Programs. We recommend that the Legislature first review existing programs to determine whether the level of funding-and the distribution of funds to districts-adequately supports program goals. Retire Outstanding Debts. As of 2005-06, we estimate that about $3 billion in various debts-funding deficits, unpaid mandate claims, and funding deferrals that we refer to as the education “credit card”-have accumulated in K-14 education. With the significant amount of one-time funds available, we recommend the Legislature place a high priority on retiring these debts. Use One-Time Funds for One-Time Purposes. Using one-time funding for ongoing purposes would make developing future budgets difficult because it creates a budgetary “hole” in the subsequent year. In addition, since Proposition 98 funding increases for 2007-08 may not be sufficient to pay for anticipated cost-of-living increases, spending one-time funds for ongoing program would add to this problem. For this reason, it is important to dedicate one-time funds for one-time purposes. Improve Local Fiscal Health. K-12 and community college districts face significant fiscal challenges. For K-12 districts, the effects of tight budgets and declining enrollment create significant financial problems. In addition, both K-12 and community college districts have significant unfunded liabilities because of retiree health benefits. We believe the Legislature should consider how to create incentives that encourage districts to address these short- and long-term fiscal threats. Given these criteria, the Governor’s proposal has several shortcomings. Much of the Governor’s proposal creates new initiatives (one-time and ongoing) instead of strengthening the base program. The proposal does retire a significant amount of debts, especially for state mandates, but leaves more than $1.5 billion on the education credit card. The Governor also proposes using the Chapter 213 settlement funds for ongoing purposes, although the funding would end after seven years. Below, we briefly describe the major 2006-07 proposals for K-14 education and our recommendations. We begin with the ongoing Proposition 98 funds. Then, we turn to a review of the one-time funding, followed by a discussion of the settlement funding proposal. a We recommend alternative implementation plans instead of the administration’s proposals for these programs. As shown in the figure, we recommend approval of many of the administration’s proposals (sometimes with important program modifications). We also suggest the Legislature consider several significant changes to the proposed spending plan. Most significantly, our alternative proposal would redirect $643 million to increase funding for the Economic Impact Aid (EIA) ($415 million) and special education ($150 million) programs. We believe existing funding allocations in these two programs do not sufficiently support the goals of the programs. In addition, our EIA proposal would provide ongoing funds for disadvantaged and English learner students in lieu of the administration’s proposal to use the settlement funds for low-performing schools (which would target limited-term funding for ongoing program activities). One-Time Funds. Figure 9 displays the major proposals in both the Governor’s budget and May Revision for the use of one-time funds for K-12 education and community colleges. Similar to the Governor’s proposals for ongoing funds, a significant proportion of the $2.6 billion in one-time funds would be used to support a variety of new and expanded programs. Our approach would use one-time funds to repay more debt than in the administration’s plan. We think eliminating deferrals is a critical step in restoring the fiscal integrity of the state budget, and retiring much of the remaining education credit card. We recommend using $718 million to significantly reduce the amount of deferrals in K-12 education. Similarly, in the community colleges, we recommend the Legislature redirect funds to fully pay off past mandate claims and the $200 million deferral. We also include $300 million for “fiscal solvency block grants,” which would provide a source of funding for districts to address a variety of fiscal problems including retiree health benefit liabilities. While these block grants are not large enough to completely resolve these local pressures, our proposal is intended to help districts begin addressing these fiscal challenges. This proposal of one-time funds is linked with our alternative plan for the use of the settlement funds. Settlement Funds. As described above, the May Revision proposes to pay the difference between actual Proposition 98 appropriations in 2004-05 and 2005-06 and the target set by Chapter 213. This amount-$2.9 billion-would be paid over a seven-year period beginning in 2007-08. While a detailed plan for the use of these funds is not available, the Department of Finance indicates that the K-12 funds would support additional funds for low-decile schools for a variety of academic improvement activities. These could include class size reduction, teacher stipends, and other ongoing or one-time activities. For community colleges these funds are proposed for technical education programs, nursing programs, and improving the transfer rate to four-year colleges. As we discussed above, we think the administration’s plan for low-decile schools would be more appropriately funded with ongoing Proposition 98 funds. Moreover, the funds could more effectively be allocated through the EIA program rather than distributed based on academic rankings. Under our plan, the settlement funds would, instead, be used to continue the fiscal solvency block grants. Beginning in 2007-08, the funding stream created by the settlement would support the block grants, which also would be broadened to include community colleges. In this way, districts and community colleges would receive a total of $3.2 billion that would be dedicated toward addressing liabilities for retiree health benefits. The Governor’s May Revision proposes a major change in transportation funding relative to the January budget. Current Law. Currently, a specified portion of the state gasoline sales tax revenues (known as the “spillover”) is required to be transferred to the Public Transportation Account (PTA). Spillover revenues are used to support both transit (rail and bus) capital improvement and operations, and to provide intercity rail services. For 2006-07, current law also requires that the first $200 million of spillover be retained in the General Fund and the next $125 million be used to fund seismic retrofit of state toll bridges. Any amount in excess of $325 million will go to the PTA. Spillover Revenue Proposed for Debt Service of Transportation Bonds. Due to recent increases in gasoline prices, the May Revision projects substantial spillover revenue for 2006-07, about $670 million-roughly $350 million more than the January projection. In contrast to current law’s distribution, the May Revision proposes that starting in 2006-07, all projected spillover (other than $125 million for toll bridges) be used to pay debt service on existing and new transportation bonds. Spillover Revenue Fluctuates Significantly; Unstable Source of Funding. In any given year, the amount of spillover revenue depends greatly on the price of gasoline as well as the sales of all other goods in the state. Everything else being constant, a large and sustained increase in the price of gasoline would significantly increase the amount of spillover revenue. Conversely, in times of stable gasoline prices, an expanding economy with growing sales of all other goods would result in little or no spillover revenue. As a result of these factors, spillover revenue has been a highly unstable source of funding for public transportation, with amounts fluctuating greatly from year to year. In 13 out of the last 30 years, no spillover revenue was generated. In the other years, spillover revenue fluctuated from a low of less than $2 million to a high of about $380 million in the current year. May Revision Proposal Would Reduce General Fund Expenditures Substantially. . . Currently, the state pays about $350 million annually from the General Fund for debt service of three transportation bonds (Propositions 108, 116, and 192). If approved by voters in November 2006, about $20 billion in additional general obligation bonds will be authorized for transportation purposes, including $4 billion for public transit. The average debt-service payment for the new bonds would be about $1.4 billion a year. Assuming continued high gasoline prices, the May Revision projects that over the next ten years, spillover revenues would total about $4 billion. If these revenues materialize as projected, the May Revision proposal to use these revenues for debt service would lower General Fund expenditures on debt service by several hundreds of millions of dollars a year. . . .While Public Transit Funding Would Be Correspondingly Less. Redirecting any spillover would result in less funding for public transit by a corresponding amount, with one-half of the redirected amount coming from transit operating assistance, and the other one-half from intercity rail service and transit capital improvements. The impact is offset to the extent that the new transportation bond, if approved by voters, would provide $4 billion for capital improvements (but not operations) of mainly bus and rail transit. In our analysis of the out-year implications of the January budget proposal, we indicated that, despite an $11 billion improvement in the revenue outlook between June 2005 and February 2006, the state would continue to face out-year operating shortfalls (that is, annual expenditures in excess of annual revenues) in the range of $4 billion to $5 billion. These estimates did not include the impacts of potential budget risks or pressures, including lawsuits, retiree health benefit liabilities, federal actions, and steeper-than-expected slowdowns in the economy. The revenue outlook has improved another $7.5 billion since the Governor’s January estimate ($5.2 billion relative to our February estimates), yet the May Revision plan would still leave the state with significant out-year budget shortfalls. 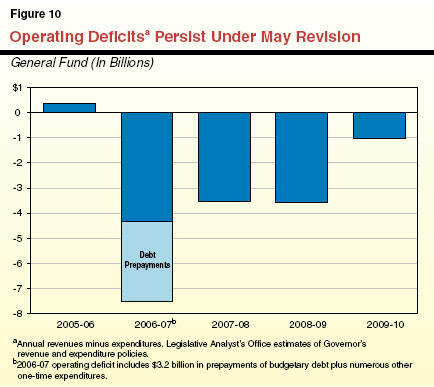 As shown in Figure 10, the state would face operating shortfalls of roughly $3.5 billion in both 2007-08 and 2008-09, before dropping to around $1 billion in 2009-10 (as deficit-financing bond debt service payments drop off). The updated estimates are subject to the same risks and pressures as our February projections, in that they assume continued economic and revenue growth, and do not include potential added costs associated with lawsuits and other factors. Should the State Adopt a Full Education Increase This Year? Despite nearly $17 billion improvement in the combined revenue outlook for 2004-05 through 2006-07 since June 2005, the state continues to face operating budget shortfalls. While the May Revision includes proposals that will alleviate some of the out-year budget shortfalls, we believe that an even greater priority should be placed on regaining long-term fiscal balance. In this regard, it will be important for the Legislature to weigh the benefits associated with fully funding the Chapter 213 target against the out-year pressures that the funding increases imply for the subsequent two fiscal years. Over one-third of the operating shortfalls projected for 2007-08 and 2008-09 is related to the added funding associated with meeting these targets in those years. How Should Additional K-14 Education Funds Be Allocated? As noted earlier, to the extent that the Legislature wishes to fund education at the levels proposed by the Governor, we believe more of the additional spending within Proposition 98 should be devoted to addressing debts and related fiscal solvency issues, and less should be devoted to new programs. Which Debt Should Be Prepaid? We strongly support the May Revision’s allocation of a significant amount of funds in 2006-07 for budgetary debt prepayment and a build up of the state’s reserves. However, we recommend that the Legislature not adopt the proposal to accelerate $1 billion of deficit-financing bond prepayments. The added payment will produce no benefits to the General Fund until 2009-10 at the earliest. This is an important consideration, given that the state faces potentially substantial budgetary challenges in 2007-08 and 2008-09 under the May Revision plan. It would be preferable to either leave $1 billion in the reserve and/or use it to prepay debt coming due in either 2007-08 or 2008-09. Examples of such obligations include special fund loans, or additional local mandate and Proposition 98 settle-up payments. The state’s strong revenue performance is welcome news and presents an extraordinary opportunity. We urge the Legislature to keep its focus on regaining long-term fiscal balance, particularly in view of the magnitude of risks and budgetary pressures facing the State of California.